The concert hall at the Sydney Opera House holds 2,700 people. This blog was viewed about 30,000 times in 2014. If it were a concert at Sydney Opera House, it would take about 11 sold-out performances for that many people to see it. My daughter Lucy gave me the above new wine journal as a Christmas gift. Now I can again systematically record the wines I was tasting. Often I displace my notes and when I want to write about a specific wine a frantic search stands at the beginning of a blog entry. Alas, order has been restored. Now I only have to use the book for the intended purpose. I am ready for the wines of 2013 it seems. Bring em on! The WordPress.com stats helper monkeys prepared a 2012 annual report for this blog. 19,000 people fit into the new Barclays Center to see Jay-Z perform. This blog was viewed about 72,000 times in 2012. If it were a concert at the Barclays Center, it would take about 4 sold-out performances for that many people to see it. While touring Prince Edward County in Ontario last summer, we also visited The Grange of Prince Edward, a winery in the West of the peninsula (Latitude: 43.947510, Longitude: 77.42377). It was the third and last winery we visited that day. 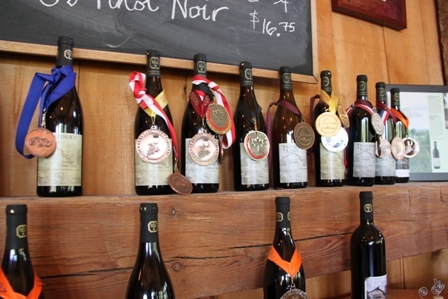 Established in 1999 on the Trumpour farm, the Grange is a family-owned wine business with about 60 acres under vines subdivided into 6 distinct vineyards. On the first vineyard of about 10 acres Chardonnay, Gamay and Pinot Noir vines were planted. Today, annual production is about 10,000 cases. The soils in the West of Prince Edward County are consisting of limestone and clay gravel. 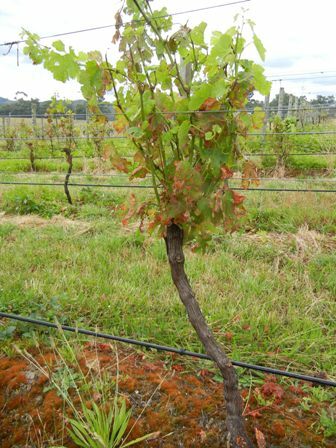 The growing seasons are short and the vines need to be buried in the soil to survive the cold winter. The place is quite impressive. The buildings seem to be new (maybe on old foundations), but the style is very rural, traditional, one could say. 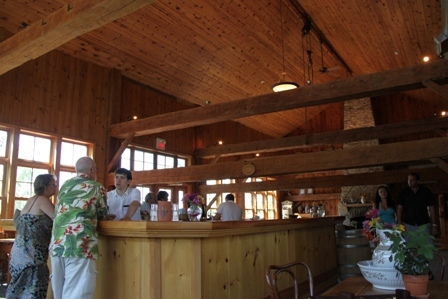 Some of the wood is old which gives the tasting room a homely and warm atmosphere. 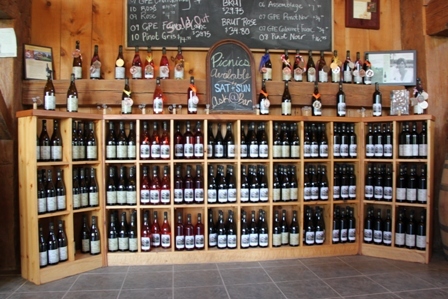 But the term “tasting room” may be an understatement. 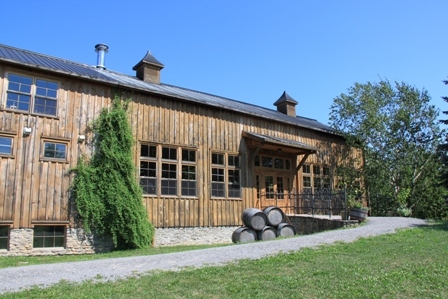 The place where the guest can acquaint themselves with the wines is barn type hall with a large bar and round tables along the windows. There are several side-rooms for functions, wine storage etc. 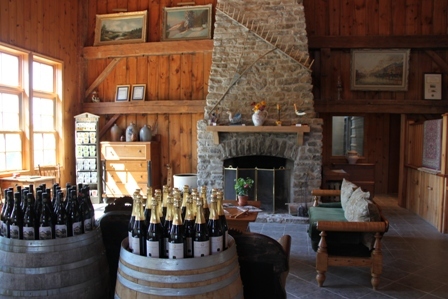 I liked the fire place, the assembled furniture, the way the wines were presented. The Grange makes Burgundy style wines. 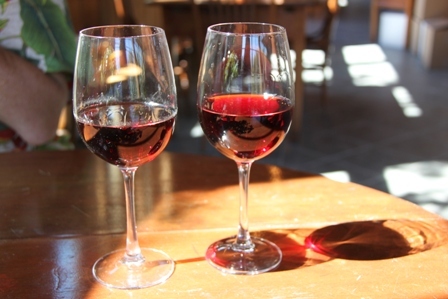 We tasted and drank two glasses of Pinot Noir, one from the 2008 and one from the 2007 vintage. Both were exquisite specimen of Pinot Noir with the right varietal expression (I admit here that I lost my tasting notes). In the end we bought a bottle of the 2007 vintage for about 20 C$, which we took home with us. We would have bought more but were afraid we could not carry them on the plane. I presented our booty in an earlier blog entry about wines from Ontario. If only we would have had more time…. 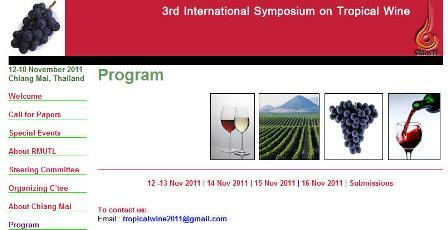 I have already announced and informed you about the 3rd International Symposium on Tropical Wine to be held from 12. to 18. November in Chiang Mai, Thailand. Now the first draft program is out. Gosh there are so many interesting sessions, international and national speakers, and exciting field trips on offer that I might not know where to go. I cannot attend all for them. Have a look and check it out. By the way, you should register, I have already done it. 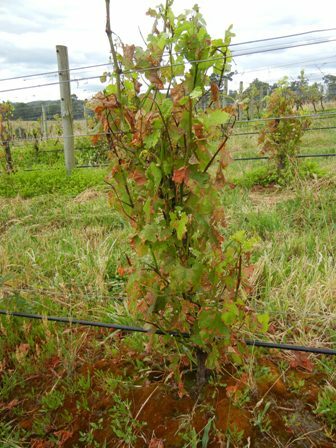 A mothballed vineyard is not a pretty sight, especially not after downy mildew had gone through it. It was so humid this spring that mildew was a real problem and we missed to treat the outbreak in good time. 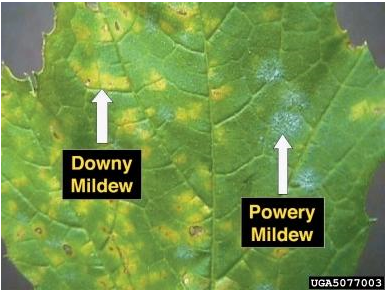 Luckily it was only downy and not powdery mildew. The difference is shown in the next picture. Mothballed vineyards react forcefully to being chopped off at the top. 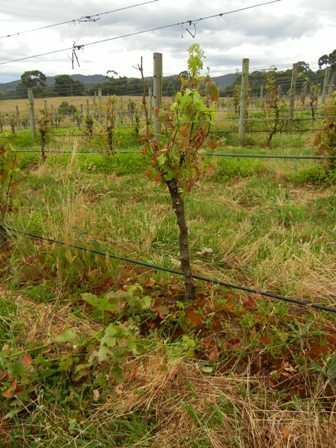 If no spurs or canes are left there, the vines respond to the brutal treatement with increased and vigorous growth of side shoots all over the place. These need to be removed. So what did I do during my holidays on the farm? I was “desucking”, as it is called colloquially. Every morning from about seven to nine I walked through the Sauvignon Blanc and the Merlot blocks of our vineyard and brushed the suckers (side shoots) off. The work is easy. It is ritualistic and has an almost religious quality. 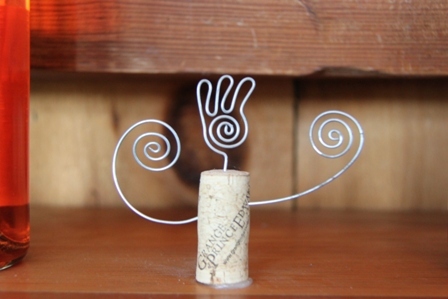 You bend down in front of the vine (and show your respect) while breaking out all the shoots except the ones on the top. Unfortunately, I could not finish the two other blocks, the Pinot Noir and the Chardonnay. Next time I will be smarter and take longer holidays. Greetings from Two Hills Vineyard in Glenburn, Victoria, Australia. Today, the year 2010 is coming to an end. As usual it was another busy year, a year which made us mothball our small family vineyard and wait for better times of the Australian wine industry. We are not giving up at this point in time. Blogging has been fun and a great learning experience. Although my day job does not leave me much time for my food and wine passion, I was able to turn our a few pieces. To all my friends, readers and followers: thank you very much for supporting me and my blog by your visits, comments and suggestions during the last year. 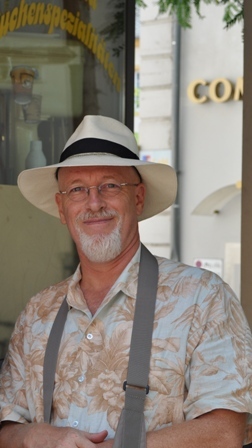 You folks keep me going; now that I will be entering the fifth year of “my life as a food and wine blogger”. I wish you and your beloved ones all the best for the festive season at the turn to the new year. May you enjoy life, health and togetherness and, of course, a glass of wine here and there. I have another poem by Jelalludin Rumi for you. What else could humans want? Happy New Year. Have a good start into 2011. You are currently browsing the archives for the vineyard management category. The days are just packed!